He's "built tough" like the moose appliqué on this handy 3-piece set. Classic stripes are so boyish! 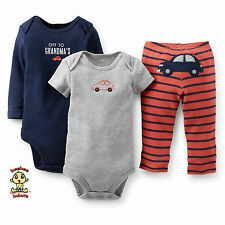 You'll love this 3-piece set featuring long and short-sleeve bodysuits and comfy pull on pants that add a little character to his style!